As usual, the editors of Lucifer, the Light-bringer try to apply Theosophia to all kinds of issues and problems that are relevant today. Theosophia is not just a dusty doctrine just to be studied, but a practical philosophy of life, applicable to every problem. One of today’s biggest problems is the large number of people suffering from depression worldwide. The number is so great that some speak of an epidemic. A study group has been discussing this enormous problem for more than a year. An attempt has been made to analyze what a depression is, how it develops and, above all, what we can do to prevent depression and how we can help people who suffer from it. This issue also includes two current scientific topics, that both have a clear social impact as well. In the article Chance or law we discuss scientific notions of chance and probability. They play an important role in for instance the quantum theory of physics, the mutation theory of biology and the game theory. Are we able to understand the facts observed by scientists in a theosophical way? Another article is about the biological assumption that everywhere in nature there is a struggle for existence. However, there is a growing number of indications and evidence that this assumption is no longer tenable and, fortunately, becomes out of fashion. The basis of Trust deals with the psychological problem that authorities no longer trust subordinates, just as people increasingly mistrust each other. However, you can also approach your fellow man with a basic positive attitude. Then another kind of society is born. Furthermore, we publish two short articles that place recent discoveries in a theosophical light: one about planet Jupiter; another one about the adaptability of plants. Finally, some questions asked to us are answered in the section Question & Answers. We hope that this issue may contribute to the practicality of Theosophia. We are convinced that the world needs this age-old Wisdom-Religion more than anything else. Your comments, questions and feedback will be, as always, highly appreciated. They help us to improve our magazine. This digital magazine is published four times a year. 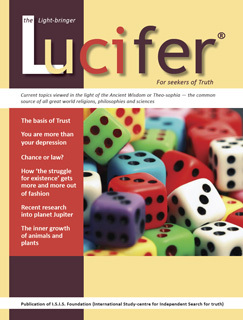 Are you interested in receiving following issues of Lucifer (free of charge), please subscribe here.